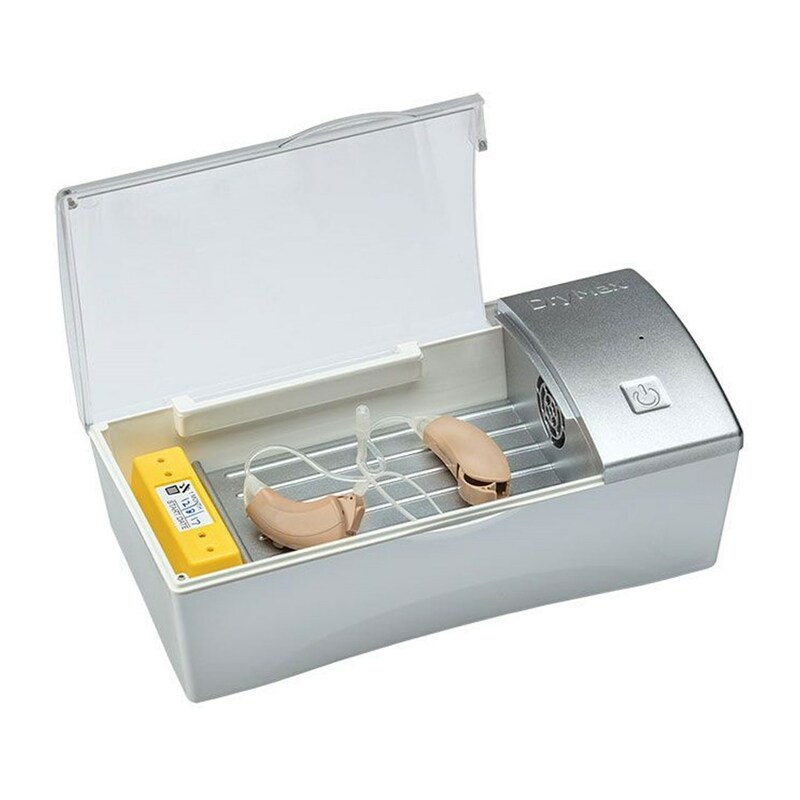 DryMax combines all 3 essential elements needed for effective drying and storage of your hearing devices: heat, moving air, and a desiccant that drives the relative humidity really low, capturing the moisture that is released. Energy-efficient electronic appliance designed for every night use to care for and store all varieties of hearing instruments-- hearing aids, cochlear implant hardware, noise or tinnitus maskers, in-ear monitors, and even wireless earphones. Large enough to accommodate a pair of devices, and small enough to take with you during travel for continued use of drying and protecting your hearing devices wherever you go. Latest innovation in our industry-leading Dry and Store product category. 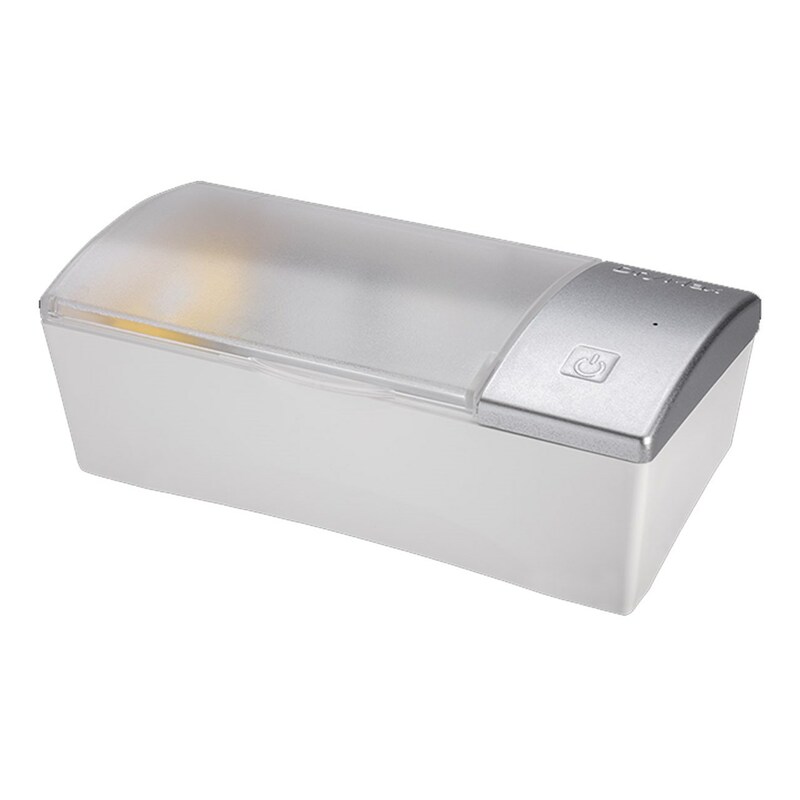 Hinged lid with a drying compartment accommodates all types of hearing aids, including many body worn aids. DryMax by Dry and Store can also be used with cochlear implant microphones, headpieces, and speech processors (both ear-level and body-worn). Electrical Characteristics: After pressing POWER, DryMax will run for 8 hours before automatically turning off. Batteries do not have to be removed from hearing aids before Dry and Store use. Opening the battery door is recommended to allow for better drying in the battery compartment area. available with US domestic or International power supplies. However, the DryMax-UV can be operated on a standard micro USB cable plugged into any USB power outlet. Can be used anywhere in the world–no voltage converter is necessary. All that is needed is the appropriate plug adapter. A worldwide configuration is also available that contains a power supply with the following interchangeable blades: AUS, EU, UK, STD. DryMax Power requirements: 5 volts Vdc, 0.65 amps, micro USB connector – 3.65 watts. DryMax can be operated on a standard Micro USB cable plugged into any USB power outlet. Can be used anywhere in the world–no voltage converter is necessary. All that is needed is the appropriate plug adapter. Desiccant: In most locations around the world, the DryMax ships with a 6-pack of Dry-Brik Mini desiccants which is a 6 month supply. The Dry-Brik Mini contains an aggressive sorbent (13x mol sieve) packaged in an attractive, molded, disposable container. Each Mini has a shelf-life of at least two years, unopened. Once the foil label is removed, the Mini lasts 1 month. Replacement desiccants are inexpensive and are available from Dry and Store distributors and directly from Ear Technology Corporation. The desiccant also absorbs odors as it performs the drying process. Safety & Regulatory: Certified to International Standard for EMC and product safety & CE marked. Conforms to IEC 60950-1 Ed. 2.0, CISPR 14-1, Ed. 5.1:2009, CISPR 14-2, Ed. 1.2:2008. Warranty: 3 years in USA and Canada. Proof of purchase required. Outside of North America, refer to warranty terms provided by distributor.